Are you thinking of getting a tan? 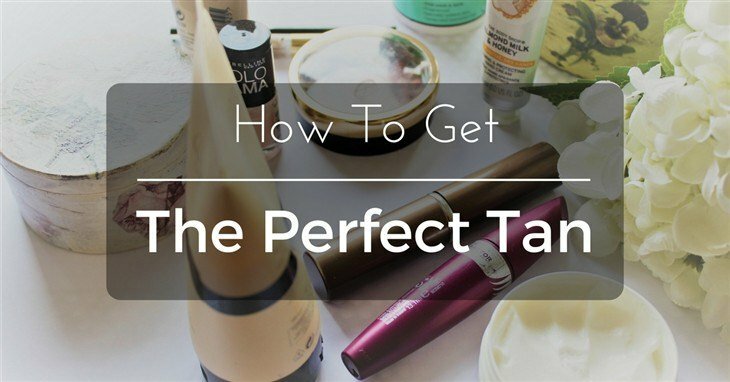 There are many options to getting that perfect glow of the skin. You can either sun tan, use a tanning bed or fake tanning. In this tutorial, I will focus on how to get the perfect tan in the outdoors. I have covered tanning in ﻿tanning beds in other articles. Here, we will delve in sun tanning as another tanning option. The sun emits rays of different wavelengths, UV-A, UV-B, UV-C. They all have adverse effects on one’s skin and health when you over expose yourself to the rays. When the sun is out, especially after a prolonged period of cold, we all feel the urge to go out and lay in the sun. However, you need to remember that excessive exposure of your skin could lead to grave consequences as mentioned above. This feature is where tanning in tanning beds is advantageous to tanning in the sun. If your skin is hydrated, it will tan faster than skin that is dry. You need to exfoliate regularly. Exfoliation helps remove and prevent the buildup of dead skin which curbs the tanning process. It will also make you have an uneven tan all over your body. When using the exfoliator, scrub gently, e.g. loofah, body scrub or even make your homemade exfoliator from honey mixed with granulated sugar, etc. As you choose a moisturizing lotion, preferably, find one that contains sodium PCA. This component occurs naturally on the skin and helps maintain a healthy skin. It attracts moisture from the air to the skin. Concentrate on the areas of your body that dry up quickly, such as elbows, toes, knees, etc. Applying moisturizer helps keep your skin silky looking. Remember to drink a lot of water and keep your skin hydrated. If you are on the beach or near a pool, get in the water, now and then to keep your skin hydrated. If you are tanning in the sun, it is important that you use sunscreen. Using sunblock will prevent the rays of the sun from affecting your skin. Therefore, for tanning purposes, use sunscreen with an SPF of 4-15. Lower SPF allows you to gradually develop a natural tan color, while are the same time protecting your skin. For the sunscreen to work properly, you need to apply it 30 minutes before heading out into the sun. If you are going swimming, then use sunscreen that is waterproof. Apply the sunscreen lotion after every 2 hours to keep your skin from burning. Use it generously over the body but apply lightly on the face. You know the facial skin is sensitive, and sun cream is made from chemicals. Once you have found the perfect spot to lie. It could be your backyard or a particular spot on the beach. Flip around after every 15 to 30 minutes to allow you whole body to be caressed by the rays of the sun, front, side, back and even underarms. Keep your arms up when tanning the front side of your body. As you lay on your stomach, keep your arms out, to expose the parts of the body that are often hidden from view. Lay down, relax and let the sun do its work. Remember to apply sunscreen regularly. Some people cover their eyes with sunglasses. However, this is not ideal as you will end having tan lines on your eyes. Consider carrying a hat, or close your eyes. Though, I don’t know how long you will be able to lie with your eyes closed while the sun is directed to you. If the rays of the sun get to the optic nerve, it will, in turn, stimulate the hypothalamus gland to produce melanin and thus, you will achieve a deeper tan. Basking in the sun between 10 am to 2 pm is not advisable, the sun is usually scorching at this time, and you will quickly burn. After several hours of lying in the sun, it is now time to get back indoor or find shade, if you don’t want to have sunburns. Consider taking a refreshing shower. It rejuvenates one’s skin by closing pores, and re-balancing the temperature of your skin. You will also be able to remove the lotions, sand, salt and any oils on your body. Remember for your skin to glow, then it has to be taken care of and make it look silky. Moisturize to keep the bronze color from becoming patchy and irregular. You also need to invest in an after-sun product that will help calm your skin, e.g. a cooling cream to prevent your skin from burning. Consider purchasing lotions made with aloe vera; it is good for calming and soothing the skin. If you don’t want to sunbath or aren’t convinced to go the way of tanning beds; you can still achieve a perfect tan by applying fake tan. You will need to exfoliate and moisturize your skin before applying any lotions or sprays. If you are a Do It Yourself enthusiast, it is going to be exciting and engaging as you try to reach your back and apply the tanning lotion gently and evenly. You can opt to have a friend do it for you or simply go and get it done at a tanning salon. Use mitts and use circular movements to apply the lotion on your skin for the smooth touch. When you feel like you want to be a shade darker; since it isn't possible to change your skin; one can always give it a shove to the tone they desire by tanning. There are several options to choose from, sun tanning, use of tanning beds of faking until you make it. For any of the tanning techniques, you will need to exfoliate and dead skin on your body and moisturize. It is not only a tanning requirement but also a necessity for a healthy looking skin. Ideally, choose a moisturizer with sodium PCA, to maintain a healthy looking skin. I cannot stress the importance of applying sunscreen; you need to limit the amount of sun radiation that gets to your skin. Preferably, use a suncream with a Sun Protective Factor of 4 to 15. Sunblock, just as the name suggests, prevents the radiation from getting into the skin, entirely. With all this information on getting your perfect bronze glow, you can get your desired color and confidently stroll the streets or beach in a healthy and glowing skin.